The question I’m asked the most: “Is the recipe on your blog?” For the last five years, I’d cringe just the tiniest bit every time I heard that, and not because of the question, because of the answer. “No…” I’d try to explain. I stink at technology. I don’t really have time. 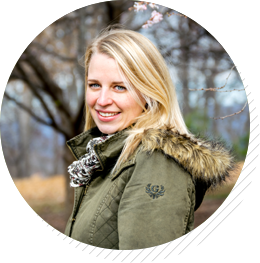 The truth is, I never felt good enough to be a “real” blogger. Still don’t. But the last few months I’ve heard a little whisper in my ear, a thought that’d pop into my head from time to time. “Bet on yourself,” it said. So I took a good look at things, cut back at work a little, and decided to give it a real go. The first step: Work my way through the bazillion recipes I’ve shared over the years, and add them to my blog. It’s been about three months, and a lot of them finally have an organized place to exist! It feels good. 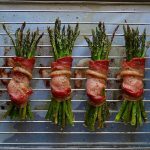 I’ve been sharing the recipe for these Bacon Wrapped Asparagus bundles (we call them Bundles of Joy! Ha!) since 2015 on my Instagram page, and today it’s finally being added to my blog. Oven roasted bacon wrapped asparagus is a super easy and absolutely delicious appetizer or side dish. When I make them for dinner parties or holidays, people go a little berserk over them. Even though they’re so simple, they feel really special! If you’re not an asparagus person, substitute haricot vert or even thin green beans – they work perfectly! And a few (Non-Whole30) tips to take them up a notch: Drizzle a little maple syrup on top, or a balsamic reduction and a sprinkle of goat cheese. So, so good. Wash and pat dry the asparagus, and trim off any woody stems at the bottom. Separate into four equal sized bunches. Wrap each bundle with a strip of bacon, overlapping the bacon as little as possible. This will prevent undercooked parts of the bacon and allow as much fat to render as possible. Use a toothpick if necessary on the underside of each bunch to help hold the bacon together. Lay each bundle on a slotted pan or use a cooling rack on top of a baking sheet (this will allow the fat to drip away from the bacon as it renders). Drizzle with olive oil (and maple syrup, if using). Place in the oven for 8-10 minutes or until the bacon is cooked well and the asparagus is crispy. Sprinkle with pepper and salt to taste and enjoy! Love the recipe for Bacon Wrapped Asparagus, and looking for more Whole30 appetizer goodness? Check out my Broccoli & Bacon Salad or BBQ Chicken & Ranch Sliders! I love this. I tried it last night and the whole family enjoyed it.